As with host entries, service entries for the host (and any other services on that host which will belong to the domain) must be added manually to the IdM domain. This is a two step process. First, the service entry must be created, and then a keytab must be created for that service which it will use to access the domain. By default, Identity Management saves its HTTP keytab to /etc/httpd/conf/ipa.keytab. This keytab is used for the web UI. If a key were stored in ipa.keytab and that keytab file is deleted, the IdM web UI will stop working, because the original key would also be deleted. Similar locations can be specified for each service that needs to be made Kerberos aware. There is no specific location that must be used, but, when using ipa-getkeytab, you should avoid using /etc/krb5.keytab. This file should not contain service-specific keytabs; each service should have its keytab saved in a specific location and the access privileges (and possibly SELinux rules) should be configured so that only this service has access to the keytab. 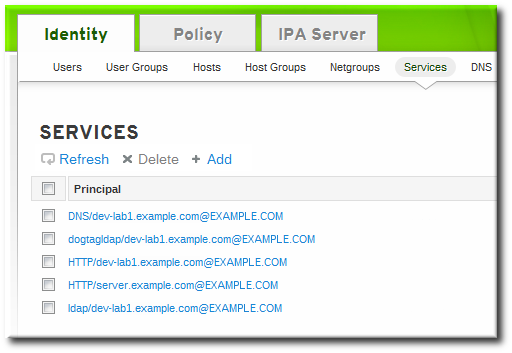 Open the Identity tab, and select the Services subtab. Click the Add link at the top of the services list. Select the service type from the drop-down menu, and give it a name. 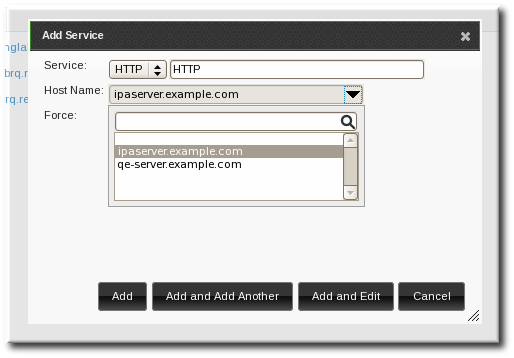 Select the hostname of the IdM host on which the service is running. The hostname is used to construct the full service principal name. Click the Add button to save the new service principal. Use the ipa-getkeytab command to generate and assign the new keytab for the service principal. The realm name is optional. The IdM server automatically appends the Kerberos realm for which it is configured. You cannot specify a different realm. The hostname must resolve to a DNS A record for it to work with Kerberos. You can use the --force flag to force the creation of a principal should this prove necessary. The -e argument can include a comma-separated list of encryption types to include in the keytab. This supersedes any default encryption type. Creating a new key resets the secret for the specified principal. This means that all other keytabs for that principal are rendered invalid. The command requires the Kerberos service principal (-p), the IdM server name (-s), the file to write (-k), and the encryption method (-e). Be sure to copy the keytab to the appropriate directory for the service. The ipa-getkeytab command resets the secret for the specified principal. This means that all other keytabs for that principal are rendered invalid.